This week I'm thinking about an assortment of cartoons published by Arthur Watts in Punch in 1921 and 1922. 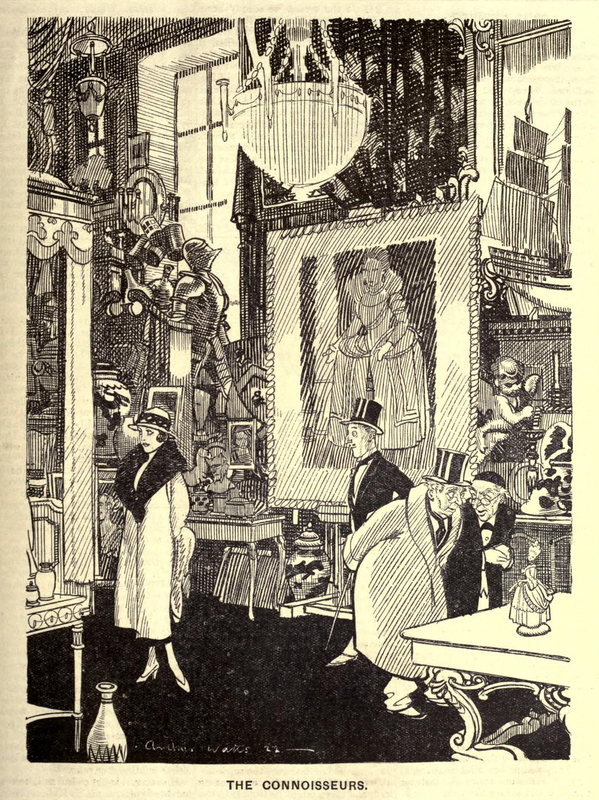 British magazine cartooning of the Jazz Age is not often admired except by patriotic nostalgists; and indeed compared to contemporary US (and Continental) cartooning of the same era it can often seem stiffly drawn and heavy-handed in its humor, especially in a venerable and slow-moving institution like Punch, which kept the Victorian tradition of the "illustrated dialogue" alive long after American magazines had converted to zippier one-line captions. There were exceptions, like the liquid-lined H. M. Bateman, who took the imaginative whimsy and narrative virtuosity of Caran d'Ache to new and boisterous heights, or the ingenious W. Heath Robinson, whose intricately silly devices for doing all sorts of work made him the British answer to Rube Goldberg (and artists like Lewis Baumer, Frank Reynolds, and Fougasse have their charms), but for the most part the Punch retinue in the years following the Great War were Edwardian holdovers whose highly polished linework betrayed a fatal lack of anything worth saying. Arthur Watts, by contrast, was very much a modern. 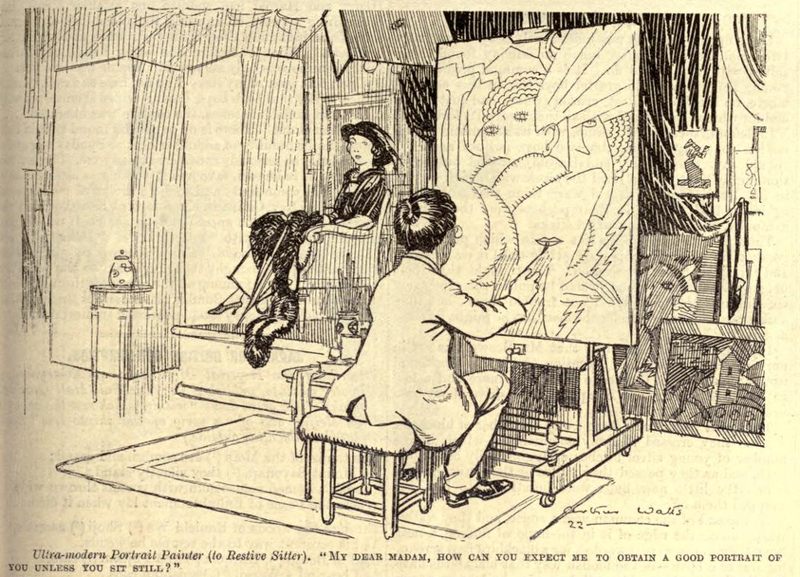 Not only does he almost always eschew dialogue, preferring illustrative captions, his cartoons are full of life and action rather than decorative poses, and though he certainly has the usual conservative streak about modern art, his compositions, with their plentiful negative space and brilliant distribution of masses, are themselves extremely advanced, borrowing the principles of decorative japonisme and applying them to busy London scenes across several planes of depth. His figure work, too, is a continual delight. Look through his crowd scenes to see if you can find any two people dressed the same or even with the same face. 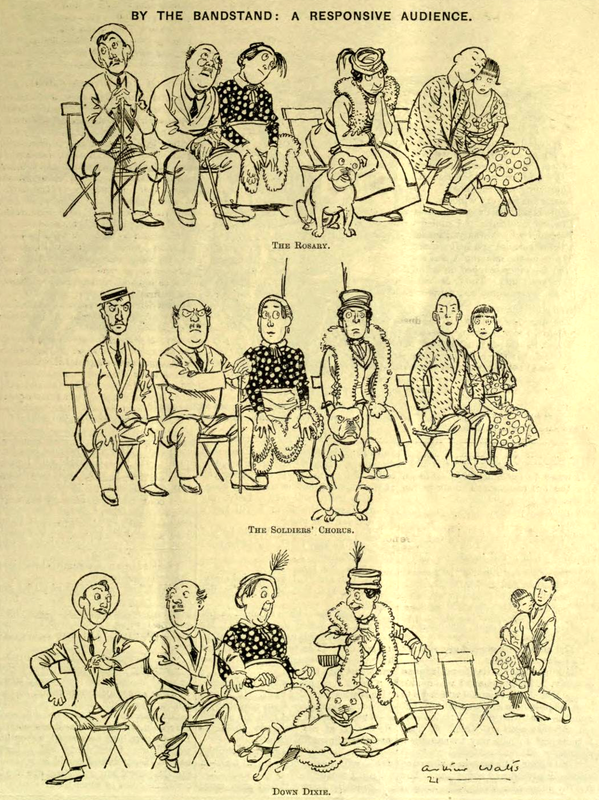 Though as the "By the Bandstand" cartoon makes clear, he was equally adept at defining the same face across several different moods. His strong but elastic line, with its sure strokes and talent for defining shape, is a model of cartooning simplicity. 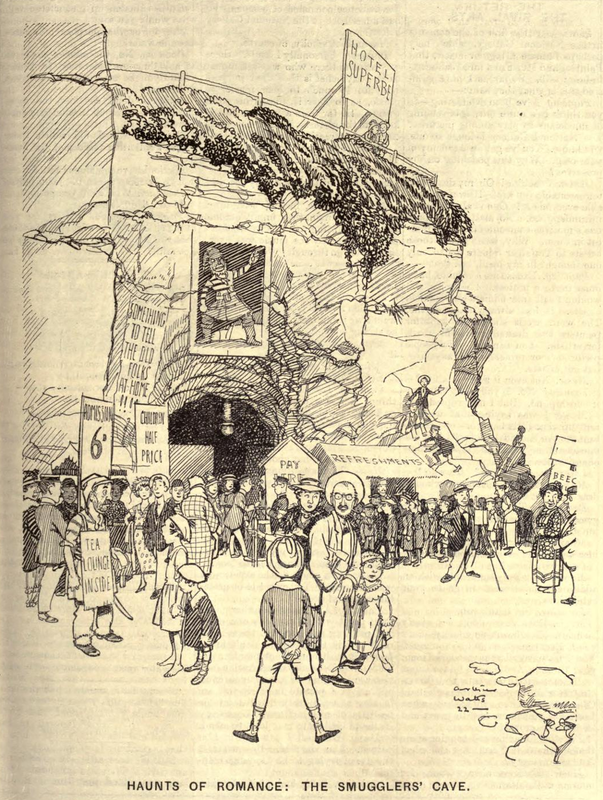 His fondness for "bird's-eye view" cartoons, in which a crowded scene is viewed from above and at an angle, was hardly unique, although again it was not much practiced in Britain: New York magazines like Life and Judge had made a regular feature of it since the early years of the twentieth century. But again his mastery of figure-work made him stand out against an American cartoonist like Johnny Gruelle, with his dozens of identical mannikins: every figure in a Watts drawing is living in their own story, even as the lines of perspective converge on a single point. Like many another regular Punch contributor, he had a sentimental streak, but he was as likely to laugh at lovers as to moon over them; and either way his drawing was so masterly that the sentiment was swallowed up in sheer inky virtuosity. 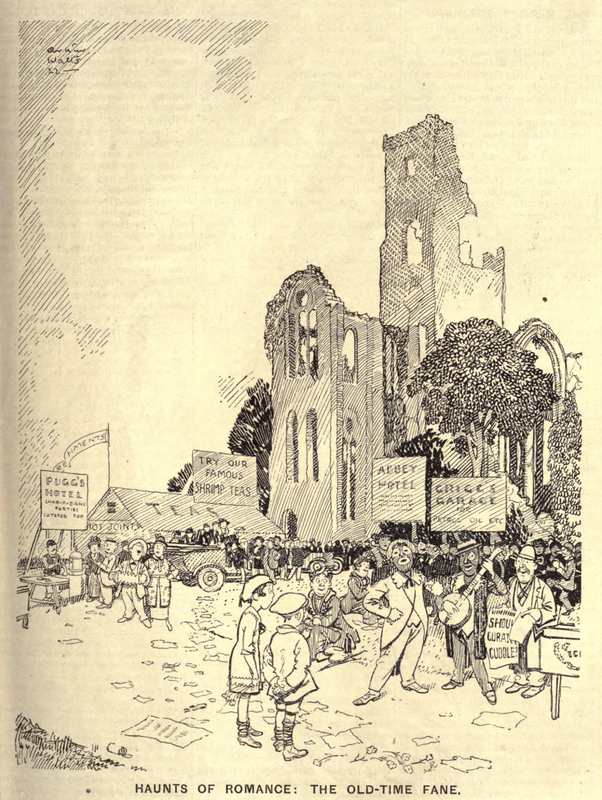 Watts' first cartoons for Punch were published in 1912, but it was not until he had served with distinction in the War that he began appearing there regularly starting in 1921. He would continue to be a mainstay in its pages until his death in 1935 in a commercial airplane crash in Switzerland in 1935. I'll close with a seven-cartoon sequence that is, in its way, Watts' masterpiece of these years. 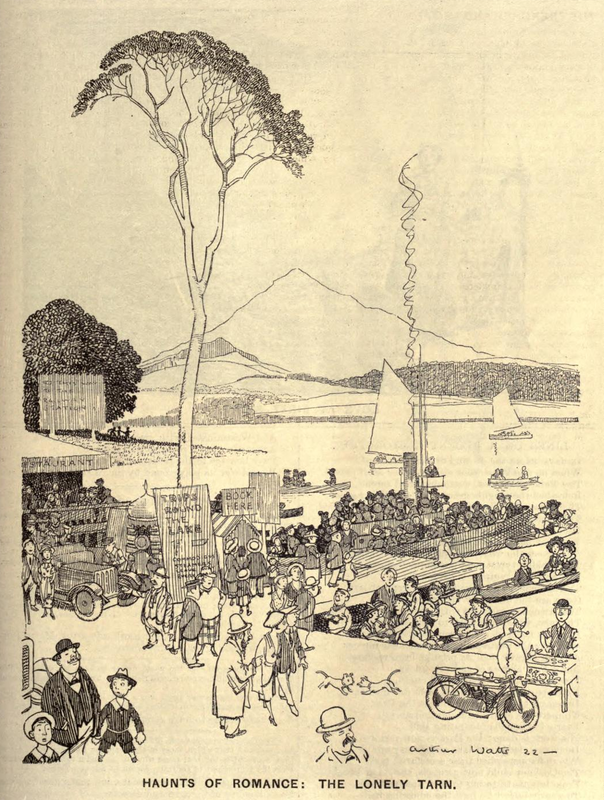 Published during the traditional holiday months of July and August, it presents seven holiday destinations which might be conducive to romance in either the lovebird or the stirring-imagination sense, but which the modern age, with its advertising, its motors, and its crowds, have transformed. An inherently conservative message, no doubt, and rather sneering about holidaying laborers — not to mention an equivocal depiction of blackface minstrelsy — it's a reminder that brilliant composition and magnificently tonal drawing are no safeguard against being a congenital Tory.